We’re delighted to be working with Man of Moon for the first time! Man of Moon are a two-piece psychedelic rock band formed in Edinburgh, Scotland. Chris Bainbridge and Michael Reid met in college in 2014 when they formed the band and starting writing and gigging almost instantly after first jamming together in class, which led to them dropping out of college to focus completely on the music. In 2015 they released first single The Road on Manchester label Melodic, which the New York Times said was ‘the best debut single from a UK band since Ceremony by New Order’. 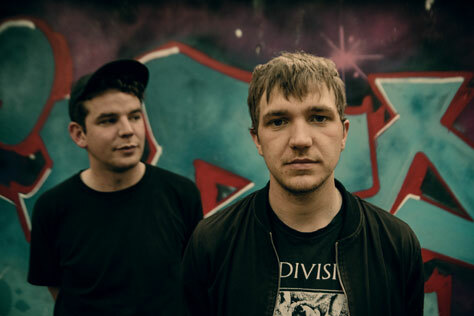 This gave the band a huge step up in the industry and they started getting impressive support slots with bands such as The Phantom Band, We Were Promised Jetpacks, Frightened Rabbit and more. In 2016 the band released their first EP Medicine on Melodic Records, which saw the band embarking on their first UK tour up and down the country, supporting The Twilight Sad on tour and playing major festivals such as T in the Park, Belladrum and The Great Escape. In 2018 the band went on tour with one of their favourite bands Django Django, the band’s biggest tour to date consisting of 20-plus shows all over Europe and the UK playing to huge crowds every night. This was the band’s first major foot print in Europe and are planning to go back soon. 2019 is the year that Man of Moon have been building up to. They will be releasing a brand new EP, Chemicals, and have plans to follow up with an album later in the year! Support comes from Idle Hours. Since releasing the tracks Powder White and TV Crush, Idle Hours have become a regular feature on the local Manchester circuit. The release of the punchy Happiest Place on Earth shows the hard work they’ve put in since their first release in April 2018 and have been on rise ever since. Living together, the band write about social media and the digital dystopia in the world we live in, with themes of Hollywood scandal and modern politics ever present in their work.